Israeli Prime Minister Benjamin Netanyahu (L) meets with Egyptian President Abdel Fattah al-Sisi in New York to discuss the Middle East peace process, in their first public talks, on September 18, 2017. Egyptian President Abdel Fattah al-Sisi met Israeli Prime Minister Benjamin Netanyahu in New York to discuss the Middle East peace process in their first public talks, his office said on Tuesday. 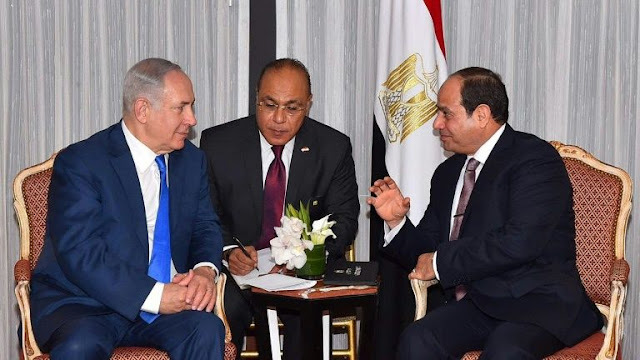 Sisi emphasised the importance of "resuming negotiations between the Israeli and Palestinian sides to reach a comprehensive solution," the statement said. The two leaders discussed "ways to resume the peace process and establish a Palestinian state," the statement said. Peace efforts between Israel and the Palestinians have been at a standstill since US-backed talks collapsed in the spring of 2014. US President Donald Trump, who visited Israel and the occupied West Bank in May, has said he believes he can mediate a final peace agreement that has eluded his predecessors. Trump too met Netanyahu in New York on Monday ahead of the UN General Assembly and again expressed his hopes for a peaceful settlement. Netanyahu was the first leader to have a one-on-one with Trump as the US president prepares to deliver his maiden speech to the annual get-together on Tuesday. Sisi is reported to have been involved in secret talks with the Israeli premier in the past. The Egyptian president joined Netanyahu for talks with then US secretary of state John Kerry hosted by King Abdullah II in the Jordanian city of Aqaba in February 2016, a former US official confirmed to AFP earlier this year.